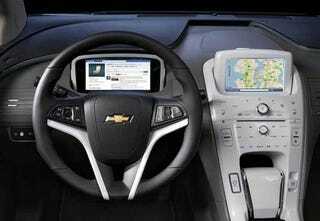 GM's next generation OnStar will get a major upgrade and challenge Ford's Sync system with infotainment options. In addition to OnStar's well-known unparalleled route guidance and safety assistance services, the new system will get apps like Facebook. A Bloomberg story outlines the differences in the new version of OnStar, which should focus its attention on more features designed to make Sync less of a deal maker for their rivals and outline the advantages of OnStar's always-on fat data pipe connection. They're reporting it'll add text message voice translation and, somehow, Facebook. Will you be able to "like" places you see on the road or "share" routes with your friends? We'll find out soon.